A story woven around alphabets. 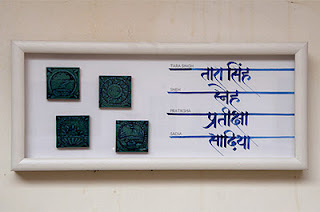 Simple yet astonishing, that is how the calligraphy work of Nikeel Aphale can be described. It is fascinating to see letters expressing different human emotions. Medium is not a limitationn for him. On his blog leehkin.blogspot.com , you can see his work in different mediums, even a green gravy in a plate in the form of calligraphy. Recently he wrote about a nameplate, which he made for us, on his blog. It is a functional art piece and projects the personality of the people living inside the house. Devnagari script has given an edge to this. It shows our belief in simplicity and Indian culture but at the same time the blue ink and white color of plate gives it a modern look. Matching the name plate’s look with the design of the door was the main challenge for him. 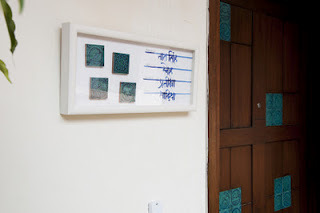 I wanted him to incorporate the hand made tiles in some way, since these tiles were already present in the door. Nikheel did it tastefully. Every time I get a compliment for my nameplate, I thank him in my mind. Another calligraphy painting done by Nikheel is adorning the wall of my living room. Harvest, the painting has golden glowing letters of roman script like the ripe wheat crop ready to be harvested. Imagination of an artist has no limits! Nikheel is a graphic designer and calligrapher and so is his wife Maithili. While Maithili is more into organized work, Nikheel left his job and is concentrating on his art full time. He has exhibited in groups and his work got honor of mention in reputed art magazines. I wish him the best in future. Who knew scripts could be so artistic..
bahut badhiya behan ji ! !